Outside of the borough (it’s a Hounslow consultation) but one which affects a route used by many local people to walk and cycle along. The river crane is hidden gem in our borough and beyond (and this article about its history is fascinating) and has the potential to provide a quiet off road route all the way from Twickenham to Hanworth Park, Bedfont Lakes and even to Heathrow Airport as part of Hounslow Council’s exciting Greenway proposals. Friends of the River Crane (FORCE) have been really effective in recognising the potential of this area and really opening it up for everyone to enjoy. The London Green Grid 2012 also identified the creation of Crane Riverside Park as “a continuous, accessible link between Hounslow Heath & Twickenham Station”. 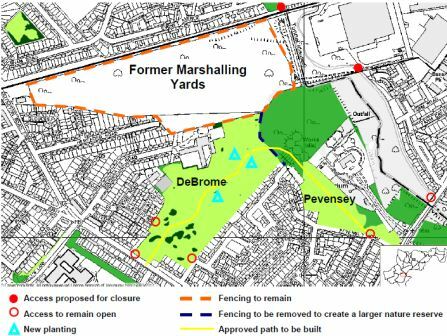 There are known issues with illegal motorbike use on the site of the former Feltham Marshalling Yards and surrounding open land and Hounslow Council is proposing to tackle the problem by closing off access along the Crane valley path. We support FORCE’s approach of working to engage with local people who live in the area around Pevensey Road. A more effective method of dealing with the problem of motorcycles is to make the open space more attractive to local people so that they use it. 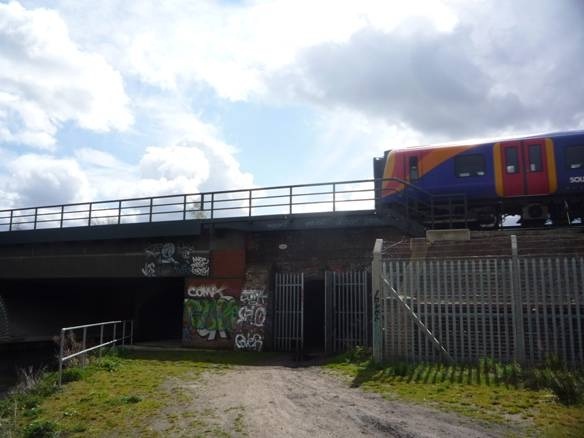 So rather than close this route, developing a cycle path through to Feltham Marshalling Yards to join up with sites upstream would also help with this. In addition, the council have already agreed to improvements to fencing and providing quad bikes to police officers to patrol the area (meeting minutes) so closure of this key path seems over the top. We would ask you to take 2 minutes to contact the council to object to the closure of this vital link and highlight the additional considerations we’ve listed above along with any concerns of your own. Responses to the consultation are to be sent by email to leisure@hounslow.gov.uk. Do copy us on info@richmondlcc.co.uk so we can have an idea of how many people have contacted the council. We will also be sending a submission from RCC. Deadline is Sunday 9 June. This entry was posted in Campaign, Consultation and tagged FORCE, River Crane by RCC. Bookmark the permalink. Bike use is growing throughout the district and will continue to do as more and more cars dominate our roads. It is important that the provision of bike routes keeps in step with this expansion – not only to handle present demand for tracks but to meet growing demand in the future. Closing the important bike access along the Crane Valley path will have 3 effects.. 1) To discourage present and future cyclists, 2) To demonstrate that the council doesn’t really care about cycling and 3) To suggest that thoughtless motorbike riders have won. Despite plans to open up Pevensey nature reserve, the extra resources for police enforcement that were mentioned in previous meetings have not been mentioned again. The decision will be re-considered in 9-12 months time.